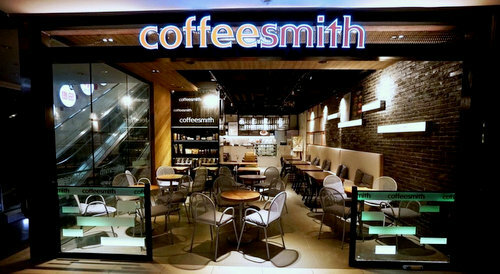 Korean coffeehouse chain Coffeesmith has two locations in Singapore, one at Bedok Mall (311 New Upper Changi Road) and another within Orchard Gateway (277 Orchard Road). Established in 2008 in Garosu, South Korea, Coffeesmith offers great coffee, teas, sandwiches, and desserts in a friendly hangout atmosphere, a cultural space for beautiful memories and moments in time. The cafe’s name is derived from “coffee” and the English suffix “-smith”, relating to someone who is a skillful craftsman of one’s product. True to this sentiment, Coffeesmith’s finest Arabica beans are blended or “crafted” masterfully to serve the true coffee lovers who enjoy the rich, delightful pleasure good coffee delivers. Overall, the menu includes a wide range of specialty coffees, espresso drinks, draft coffee, regular teas, herbal teas, tea latte specials, hand-made yogurts, frappe / ade drinks, snow flake shakes, desserts, ice creams, as well as beer / cocktail coffees. The official Facebook brand page for Coffeesmith Singapore is available at www.facebook.com/CoffeesmithSG. Following the Facebook page, you’ll get updates about the coffeehouses’ promotional offers, new menu items, events, and much more.